​RSE for all classes takes place in the 5 weeks following the February mid-term break each year. This is a spiral curriculum, which builds each year on learning from the previous year. There will be lots of learning about friendships and new babies so listen out for talk and conversation about that. The RSE programme content is available online, where you can access it if you want to know more. Last Thursday night's talk for parents was a great success! It followed on from a Digital Citizenship day at the senior end of the school, where children from 3rd to 6th classes participated in workshops with John Wills from schoolsupports.com. Later, it was the turn of a room full of parents. John's comprehensive talk covered the topics listed below and answered parents' questions, too. We are delighted to see parents in our community taking their role in raising good digital citizens seriously, and to be able to help facilitate this by providing workshops like these. Check out John's website; https://www.schoolsupports.com/cyber; for useful links and some of the resources John directed us to during his talk. We are delighted to announce that we will have a guest speaker at the school on January 31st, speaking about the topic of Cyber Safety. John will be speaking to pupils in the Senior Classes (3rd, 4th, 5th, 6th) during the school day, and will then give a talk for parents from 7.00-8.30pm that evening. We strongly encourage parents, particularly those with children at the Senior end of the school and those parents who engage with social media themselves, to make an effort to attend this talk, as social media has become such a normal part of many children's lives and of our own lives. As well as educating ourselves on the possible dangers of our own behaviour online, it is crucial that parents inform themselves regarding the apps and platforms that their children are engaging with, and to be aware of the steps that can be taken to prevent children exposing themselves to unnecessary risk. John will also be happy to answer any specific questions you may have around this topic. We hope to see a great turnout on the night. In recent years, society became very aware of the problem of child abuse through neglect, emotional, physical, or sexual abuse. Every adult has a moral duty to protect children. Children First, the National Guidelines for the Protection and Welfare of Children, note that teachers are particularly well placed to observe and monitor children for concerns that might relate to neglect and/or abuse. The Department of Education published Guidelines and Procedures for all schools in relation to child protection and welfare. These guidelines promote the safety and welfare of children. The Board of Management of Citywest ETNS has adopted these guidelines as school policy. If school staff have a concern or are given information about possible or potential child abuse or neglect (including emotional, physical or sexual abuse) they are obliged to refer this matter to TUSLA, the child protection agency. TUSLA will then assess the situation and may follow up with the family and child concerned. Teachers can no longer use their own discretion in deciding whether to report a matter to TUSLA. We are obliged to report every disclosure and every concern. Children First, the National Guidelines for the Protection of Children may be accessed on the website of the Department of Children and Youth Affairs (www.dcya.ie). The Department of Education and Skills Child Protection Guidelines can be read on the Department’s website (www.education.ie). Citywest ETNS Child Protection policy is available on this website also. Citywest ETNS would like to say a massive thank you to everybody who participated, or bought a book in the book fair this year. It was a massive success, which is all thanks to you, our community. We are happy to say that we raised just over €3000 this year, which is amazing! Last year, we used the funds raised to purchase reading books for the school and we hope to do similar again this year. The children got a lot out of the new books this year and we would like that momentum to continue. Finally, we would like to say a HUGE thank you to all the parent helpers who helped out this year. They took time out of their schedules to help us out and none of this would have been possible without them, so another huge thank you from everybody here at Citywest ETNS! We would like to sincerely thank everyone who has donated books to our school and classroom libraries over the past number of years. We are delighted that we now have all the general reading materials that we need. We continue to work on sourcing specific reading programmes that are used in the classrooms. Any remaining space in our libraries will be required for these materials. We are therefore no longer in a position to accept further book donations to the school. Should a need arise in the future for general reading books, we will get in touch. Last Friday, we had a lovely addition to our weekly assembly. For the first time, a class presented a piece of work that they have been learning about in the past couple of weeks. This sharing of knowledge is an important part of our Learn Together curriculum, and we were delighted with the standard set by Bobby's clever and creative Second Class. 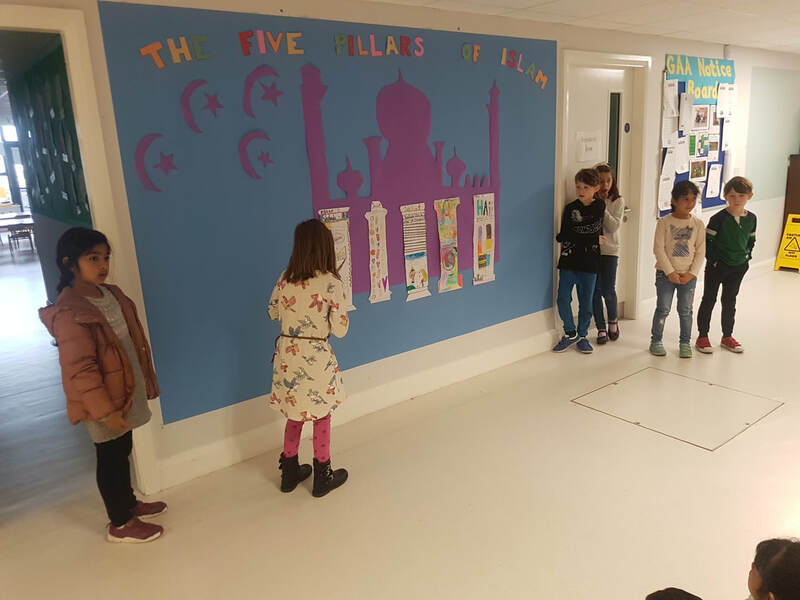 Bobby's class have been learning about Islam and they made a fabulous display about the Five Pillars. They then presented the information they had collected, loudly and clearly, for the whole school to hear. We were so proud of them! Well done, Bobby's Class. ​We look forward to hearing from another class next month! A Woman's Place is in the Home? Due to questions over the new Admissions Act and in the expectation of instruction related to that coming from our Patron, we had not opened the pre-enrolment list for 2023 in early summer, as we would usually have done. However, as no progress has been made in relation to this, we have proceeded to open the pre-enrolment list for that year. It now seems likely that we will be required to implement a new enrolment policy from 2024. We await further instruction in relation to this from both the Department of Education and Educate Together Central Office. It can now be expected that our current Enrolment Policy will be used to allocate places up to 2023. The Board of Management of Citywest ETNS thanks Paul Flanagan and Norma Healy for their years of service to our school. Their resignation from our Board leaves two Community Nominee vacancies which we need to fill. Our Board of Management is a vibrant, engaged group of dedicated people who strive to lead our school to be the best it can be and to ensure that the Educate Together ethos is upheld at all times. The roles of Community Nominees are important in the aim of ensuring transparency, fairness and quality assurance in the leadership of our school. It is important that, when our Board of Management considers an issue, a diverse range of perspectives are offered and considered. Prospective candidates should not be parents of children in our school as our parent body are already well represented. Neither should prospective candidates be employees of the school. We ask parents, guardians and friends of our school to consider who in their circle of acquaintances might be a good fit for one of these roles and direct any potentially suitable candidates towards us. All interested parties should contact the school office.